This one is ongoing. It morphed into the current form in 2014, so 2018 is fifth year of this version. See more on this and other videos on my You Tube channel. Also within this trial are some explorations of no rotation (link to video made 09/16). The beans are fifth year same place, leeks fourth year, potatoes + broad beans 3rd or fourth year. The three strips are 2 metres wide, 9 metres long; each strip comprises six small beds. STRIP 1 soil loosened by forking 10-11in/25-27cm depth each autumn/early winter without inversion, then 2in/5cm bought* compost on the surface. A different method to my dig/no dig trial. 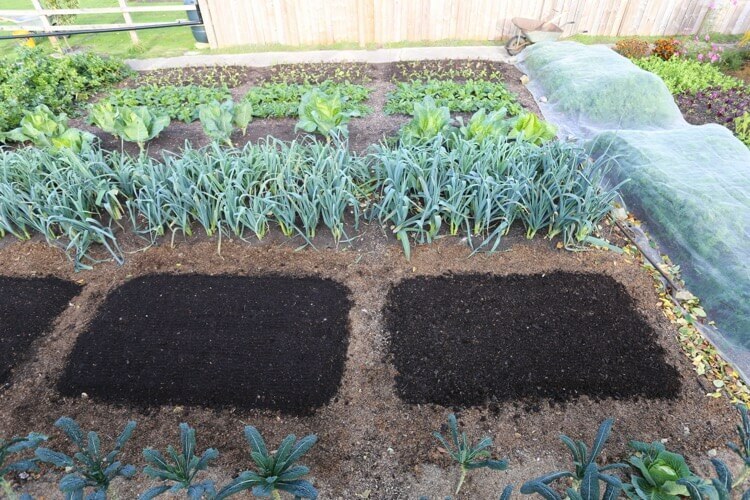 STRIP 2 no dig, was mulched initially with polythene 2013, and 2in bought* compost is spread on the beds each winter. STRIP 3 no dig, 2in composted cow manure on the surface each winter; in 2017 and ’18 this manure was finer and older when applied. See below for four years’ graphics and results. 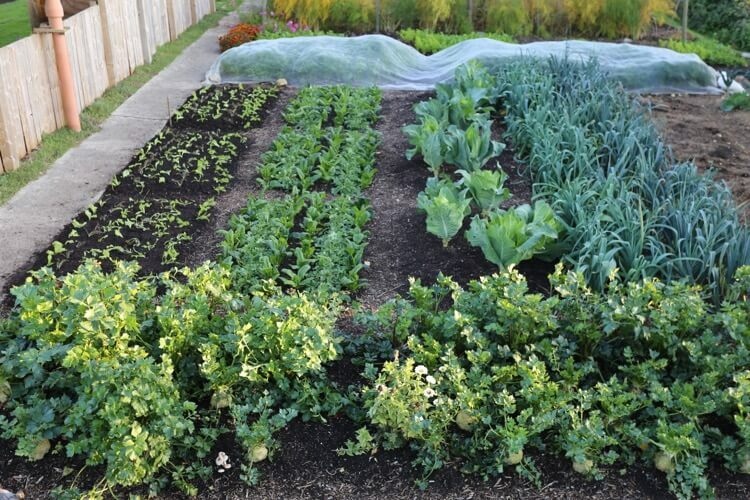 On 12th January I planted December-sown broad beans, Aquadulce, in the same beds as for several years. 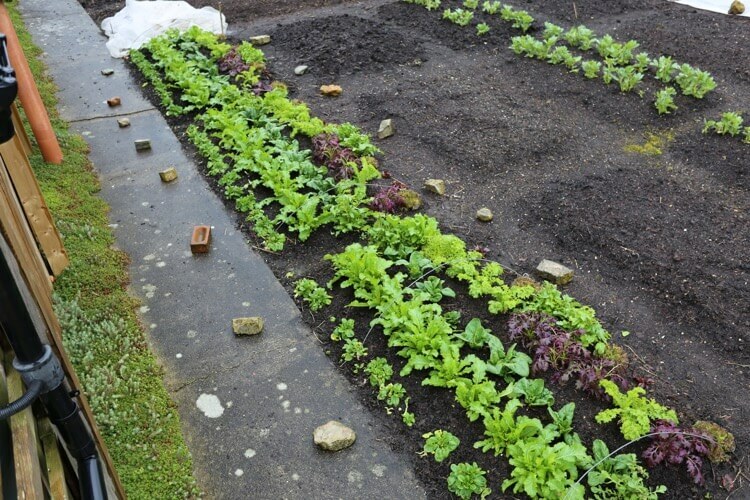 We made plantings on 2nd April of lettuce and spinach, in the same beds as 2017. 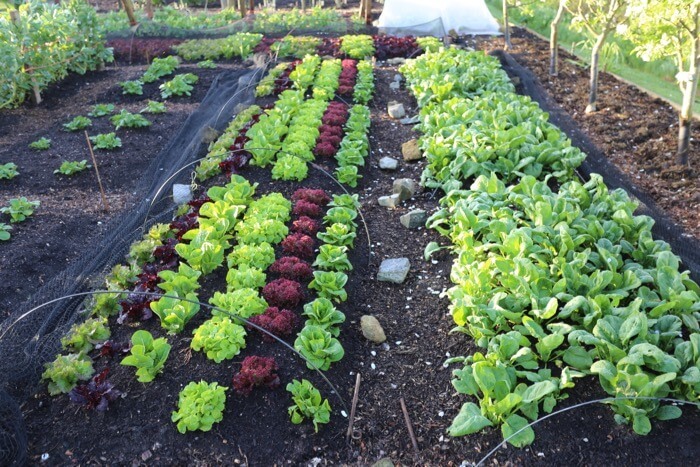 Meanwhile the salad under mesh cropped well through winter, mostly mustards, but most pest damage to leaves was on strip 3.
strip 1 4.61kg, strip 2 5.89kg and strip 3 4.50kg of saleable leaves. Then on 24th May these beds were planted to two week old Borlotti and Czar runner beans, for the sixth year consecutive, see photos below. 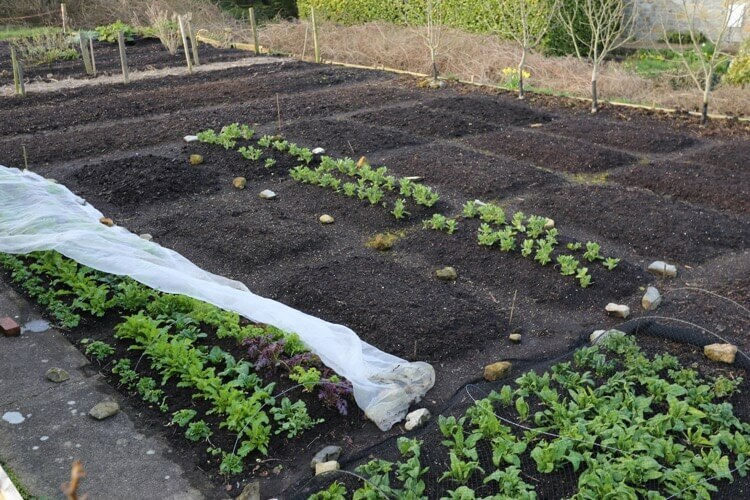 Beds ready late March, plus the overwintered salads & broad beans. Strip 1 is nearest, on diagonal to top right. 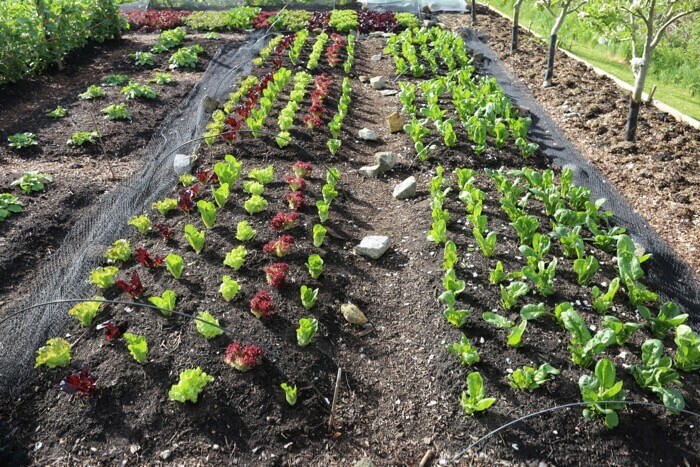 10th May, before first harvest of lettuce and spinach leaves, planted 38 days earlier from sowing early March in greenhouse. On 13th August, Steph held a stepladder while I took photos of the two pairs of strips. Near the camera was spinach, now kale. 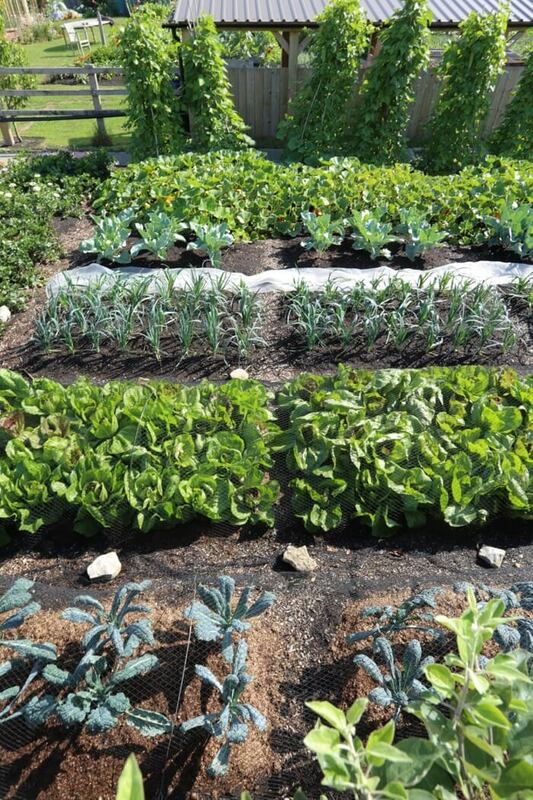 Then the lettuce beds are now chicory, and potatoes (see video) are now leeks. 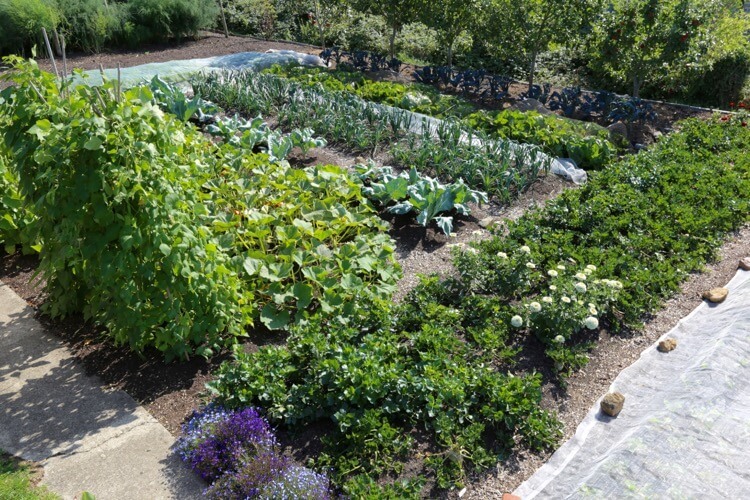 Broad beans finished in June and are now cabbage, the Kuri squash are close to ripe, and beans look strong. 13th August, on left is strip 1 forked beds, on right is no dig and both have the same compost on top. There has been a similar pattern in the harvests of 2018, compared to previous years. The forked strip gives consistently lower yields, although plants often look similar. Strip three, cow manure sometimes gives bigger harvests but has a few strange ‘failures’ as with squash in 2018. Growth generally is stronger than before. 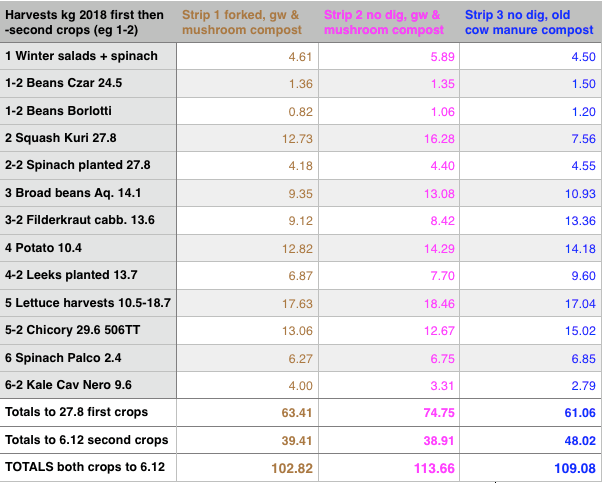 Three strip trial harvests kg 2018 up to 06/12/18. First number in column 1 is the bed number of each strip, from 1-6. if it says 1-2 that means second crop of bed 1. Hello Charles. My name Malcolm. We have a allotment ina place call Alsager .at the moment we are in Spain. We always get back in April time after been away for the English winter. We I get I am going to start to do the no dig the same as you. I will take some photos before and after , and then forward them onto you. Can’t wait to get started , by for now. Thank you for your willingness to experiment. 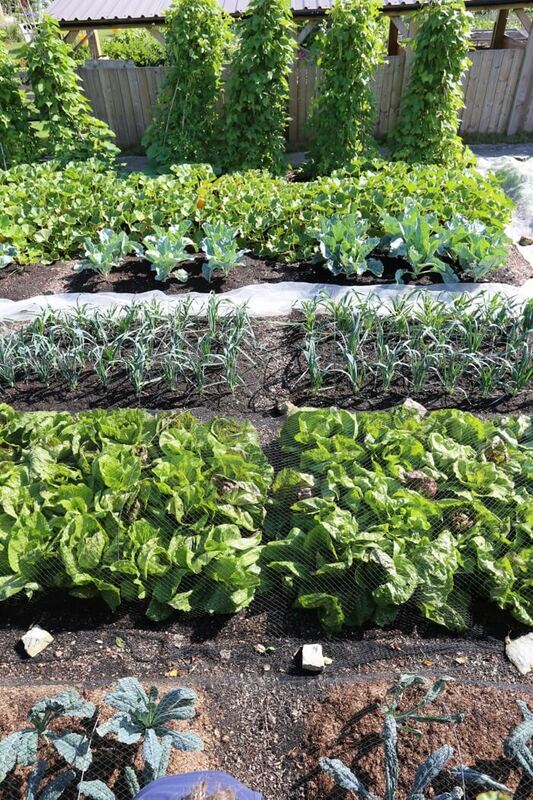 Is one possibility that root crops like carrots and beets produce higher yields when their beds are forked? The carrot yields are striking. The beet yields are mixed. It might make some intuitive sense. Whether it is true or not, I don’t know. Hi Billy Joe, an interesting question. The % of carrots forking is not high enough to influence results. Perhaps if enough of them obligingly made two nice roots, it could make a difference!